We are a small Company of Professional Forex Traders and we are developing Automated Trading Systems with a Real Trading Edge. You can learn more about us on our website - www.aicapital.eu. Our System is based on pure Price Action - no Indicators, no Martingale, no Grid, no Scalping... All trades are opened with predetermined stop loss and take profit. The Average Trade Length is 4h 31m. Usually the longer lasting trades are the profitable trades. Losers are usually closed a lot faster. We use positive risk reward ratio, the average win is 39.54 pips and the average loss is -21.87 pips. Unfortunately when we were linking and migrating our history, the old Broker decided to archive it to the beginning of 2017. Sadly, it can not be undone. But that is fine, we are sure and confident with the success of our System. You can see our tests, which are performed on specially developed software and additional licensed programs for access to quality Tick Data here - www.aicapital.eu/en/results/. Of course, there is a tab with the life results too. The profit/loss ratio of each trade is always positive – the potential profit of each trade is always greater than the potential loss. This means that even if you have more losers than winning deals, the end result will be positive. It relies on real market dependencies rather than random market theory – opens a position only when there is a pre-defined set of conditions. This means that there may be days, even weeks, without a single deal if the necessary conditions are not present. We use stop and target with every open trade – you can not get into a situation where you have positions out of control. The stop and the target are set directly with the order to open the position, the eventual loss is always calculated. Due to this, long-term losing positions are not “dragged”, which are a prerequisite for bankruptcy. Integrated Money Management – our system has an algorithm for controlling the volume traded. The calculations are made in milliseconds, based on the current account balance and the preset risk parameter. Risk Parameter – this is a parameter that in combination with the money management provides the most effective account management. A higher risk parameter means higher drawdown and tolerance to loss and significantly higher profits as a result. Thanks to this setting, you can be a aggressive speculator or a conservative investor. Slippage filter – If the slippage exceeds the set value, the robot will not open any deals until the conditions for trading are normalized. Spread filter – If the spread exceeds the set value, the robot will not open until the trading conditions are normalized. This protection can save you not only by your broker, who may try to worsen your trading conditions and performance, but also in the case of a “black swan” event. In the event of such events floating spreads may increase hundreds or even thousands of times. There have been many such cases in recent years, for example, the abolition of the Swiss franc threshold by SNB and Brexit referendum. 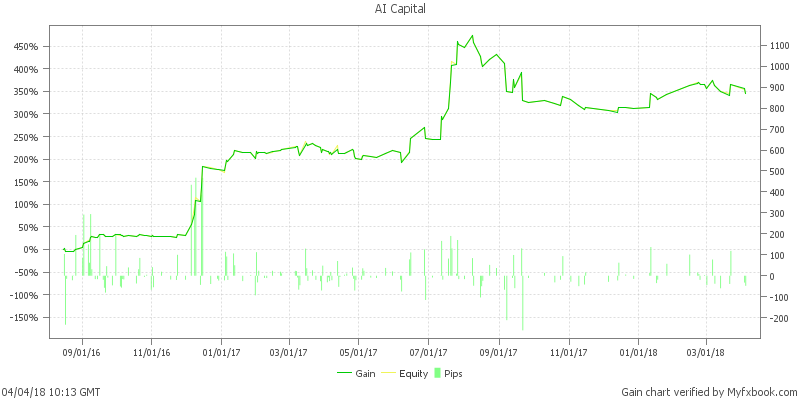 Equity percentage protection – If the day’s loss exceeds the set value, the robot will close all open deals and will not open new ones until the next day. Our system is suited for high volatility, but we know that there is some unpredictability in the markets and we want to be prepared and able to continue trading tomorrow even in the worst case scenario. The algorithms of AI Capital Ltd. are specially developed for our needs, are subject to constant optimization and are protected by the Copyright and Related Rights Act. Thank you very much for this detailed introduction, and your level of transparency. btw, your website looks great! May I wish you all the best for you and FMZ, welcome aboard! it is strange though that group of professional Forex traders would be working with such a broker who play tricks and can not support with history. It is not a problem to share it, you can see it also from myFXbook link - the Broker is ActivTrades. They are FCA regulated, have a really good spread and also have a local office in our country. ActivTrades have many servers and want to make the database smaller, we don't consider this as a trick but they should ask us before do that. They send us the archived history in separated file but it couldn't be imported in MT4 (their words). We have many accounts but this one was with our longest history, with the latest System. We forgot to mention that our System is aimed for Long term profit. We have good and bad periods but at the end the results are very promising. I think @Monkeh was speaking about the registration number of your company: AI Capital . On your website I can't find names, address or registration number. We are registered in Bulgaria but we don't think that this is relevant for our Darwin or Darwinex. The info is on our site but it is on Bulgarian. Our system is trend flowing and it is a month with strong moves. Every system which is trend following will have similar curve. And it is clear that in the long tern the systems have nothing in common. Also our system is obviously better in terms of returns. A system with higher drawdown and lower returns is staying in the competition (probably because was losing in the previous months) is not good at all! You are right, it is an old question. They have a lot of work to do with correlation. We have made some improvements over the time and include 3 more instruments for diversification of the risk and to achieve better results - usd/jpy, gbp/usd and gold. By signing up for the course you will receive 10 Lessons for 10 days on what to expect and how to deal with Automatic Trading. This course will provide you with knowledge and understanding on how long term profitable systems work. We do NOT promise that you will get rich overnight. We do not make ridiculous claims (like those you see in online ads) that you will make millions for just a few months. This course WILL, however, offer you most of the knowledge that we have acquired over years of building, testing and trading different systems. You will understand what are the pitfalls and the keys for success with using Forex Robots. 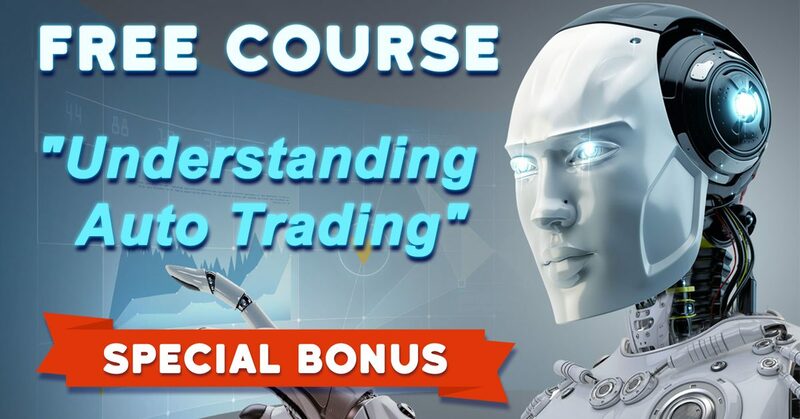 With this course you will be able to avoid the hundreds of mistakes we have made during our journey in the world of Automated and Manual Trading. By the end of this Automated Forex Trading course, your confidence as a trader will soar. You will have totally different understanding of Algorithmic Trading and trading as a whole.